◎ On March 21, Chinese state media published the Chinese Communist Party’s (CCP) plan for reforming its Party and state institutions. On March 21, Chinese state media published the Chinese Communist Party’s (CCP) plan for reforming its Party and state institutions. 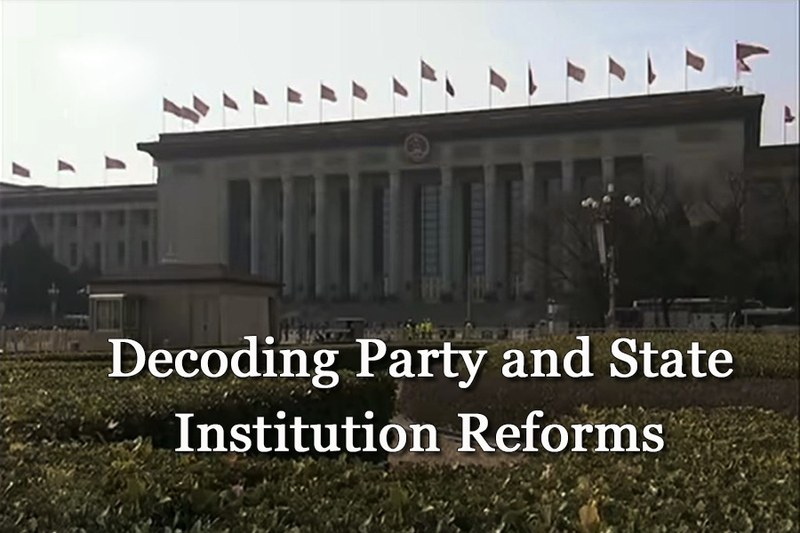 The plan listed 60 reform programs covering institutions in the Party bureaucracy, the Chinese legislature, the State Council, the political advisory body, administrative law enforcement, and the military police and public security forces. The plan also listed reforms of organized groups and local bureaucracy. 1. An Advancing Law-based Governance Leading Group will be established, and its administrative office will be located in the Ministry of Justice. 2. The leading groups for deepening reform, cybersecurity, economics and finance, and foreign affairs will be upgraded to commissions (wei yuan hui). 3. The CCP Organization Department will oversee the appointment of civil servants. 4. The Propaganda Department will manage all publications, film production, and news media work, taking over from the State Administration of Press, Publication, Radio, Film and Television. 5. The United Front Work Department will centralize control over religious communities and ethnic minorities, as well as policy toward overseas Chinese. The Department will also direct the National Ethnic Affairs Commission. 6. The Central Public Security Comprehensive Management Commission and the Central Government Leading Group for Stability Maintenance (and its administrative office) are dissolved, and their functions will be handled by the Central Political and Legal Affairs Commission. 7. The functions of the Central Leading Group on Preventing and Dealing with Heretical Religions and its administrative office (the “610 Office”) will be assigned to and divided between the Central Political and Legal Affairs Commission and the Ministry of Public Security. 1. A National People’s Congress (NPC) Social Building Commission will be established. 2. The NPC Internal and Judicial Affairs Commission will become the NPC Supervision and Judicial Affairs Commission. 3. The NPC Legal Affairs Commission will become the NPC Constitution and Legal Affairs Commission. 1. The reforms were announced on March 13 at the Two Sessions. See our March 13 article for details. 1. New law enforcement teams responsible for supervising agriculture, marketplaces, ecology and the environment, and transportation will be integrated and set up. State Council ministries and commissions will direct these law enforcement teams. 1. All State Council-controlled People’s Armed Police (PAP) forces and domestic security units under the armed police are no longer part of the PAP. 2. Marine police under the State Oceanic Administration are transferred to the armed police force. 3. PAP corps responsible for overseeing civilian affairs like mining, forestry, and hydropower will be reorganized into non-active duty professional squads and placed under the leadership of their respective government agencies. 4. PAP’s customs service corps is dissolved. 1. Governments at the provincial level and below will be granted more administrative autonomy. Local authorities are also allowed to, within prescribed limits, set up or merge institutions per their economic and social conditions. 1. During his first term, Xi Jinping carried out a string of reforms to consolidate his control over the Chinese regime. First, he brought the Party under his sway through an anti-corruption campaign and “strictly governing the Party” (“cong yan zhi dang”). Next, Xi wrestled control over the military from his rivals through implementing sweeping military modernization reforms. After the 19th Party Congress, Xi appears to be centralizing his control over the state apparatus by reforming the various government agencies. 2. Xi promised to implement “comprehensive reforms” at the Third Plenum of the 18th Central Committee in 2013. However, he failed to make much headway in the economic and political front, and could only advance his anti-corruption drive and military reforms. 1. The Party and state institution reforms strengthen the Party’s control over the regional governments and society at large. And because Xi Jinping dominates the Party, power becomes centralized in his person. 2. The reforms gave the State Council additional social management duties, but weakened its overall power because some of its decision-making responsibilities were transferred to the central authorities. 3. The tax system reforms strengthen the central government’s control over the finances of local governments. With a better grasp of the financial situation in the provinces, the central authorities can curb excessive local government debt and prevent a debt crisis from worsening. 4. The reforms strengthen the CCP’s external propaganda, subversion, and infiltration capabilities. Domestically, the reforms enhance the CCP’s control over society, religious communities, ethnic minorities, culture, and ideologies. 6. The dissolving of the agencies responsible for stability maintenance and security management, as well as the absorption of the 610 Office by the Central Political and Legal Affairs Commission, appears to signal a rejection of Jiang era social repression policies. These reforms create an opening for the Xi administration to clean up the domestic security and legal apparatus further. 7. Judicial reform will be carried out in the name of “advancing law-based governance” to prevent the localization of the judiciary. Also, the Central Political and Legal Affairs Commission will see its influence weakened further after the local courts, procuratorates, and the National Supervision Commission fully implement vertical management. Under vertical management, local judicial organs answer directly to their respective provincial branch, and not to local Party committees who may sway judicial decisions out of political reasons. 9. In an environment of increased centralization, the granting of greater autonomy to local governments will benefit regional economic development. Xi Jinping is bound to hurt the interests of the influential CCP elite in implementing the sweeping Party and state institution reforms. In other words, he could only pull off the reforms after consolidating absolute power in the Party and gaining the upper hand in the CCP factional struggle. If the rule of law is sufficiently embedded in the government and society, then Xi’s rivals would find it difficult to carry out retaliation via Party rules when he is no longer in power.